Collaboration is a powerful route to success for small business growth. Collaboration is not limited to a specific type of business. Any business owner can reap the benefits of collaboration with other business owners. Entrepreneurs collaborate, connect with each other, and, together, grow their business to the next level. Inexperienced entrepreneurs might not know the benefits of collaboration. Typically, they want to grow their business on their own, with no external input of any kind. Collaboration inspires new vision and new techniques for the same old business. Often, entrepreneurs forget to reach out to new strategies and set better goals in the daily grind of their day to day business operations. They forget to try something new in their business. They avoid using new tools, especially those with which they are unfamiliar. Entrepreneurs might have been reading blogs, news, and using media resources to update their knowledge, but the benefits are limited if it is not used practically. Collaborating, having regular meetings, and sharing experiences leads to trying out new techniques and tools for small business growth. Having a huge network is an important tool for growing your business. Small business owners usually have a limited network of their clients. Building your network will develop new contacts. Alliances are made for collaboration building. A network of clients and colleagues is increased. Every collaboration does not ensure a huge network of contacts but it is a way to continue growing your network. Learning comes with collaboration. Most businesses, initially, were small businesses. Using proper resources, funding, business bookkeeping and accounting management, making the right decisions at the right time and in the right direction made those businesses grow into medium sized or even large corporations. 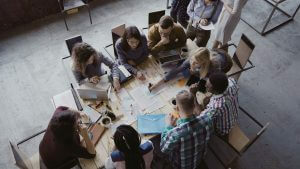 When collaborating, not just the business collaborates, the experiences are joined and there is learning for everyone who becomes a part of the business collaboration. Every business owner uses his/her techniques, experiences, and learning in individual businesses. With collaboration, new learning in business dealings opens its way. In many collaborations, expenses are split among firms, the work is sometimes divided, and there is an intellectual contribution from all parties. If a business collaborates with another business for a marketing or promotion of services point of view, revenue can be increased using less resources and at reduced costs. Any business can face difficulties. Through collaborations, entrepreneurs can utilize the expertise and experience of other business holders to overcome their difficulties in business. New marketing strategies can be used for business growth. After collaboration, the experience of other companies is kept under consideration for making any decisions in the business. If ever we face problems, we need someone to rely on. In business, too, many problems can be solved just by collaboration with other businesses. Clients can be referred to other firms with whom there is collaboration in business. Collaboration is good for entrepreneurs if they are told to use the tools of collaboration. They must understand when and how the collaboration is an important step in their small business growth and survival. Small business collaboration can be among two entities that offer related products or services. During collaborations with businesses, proper agreements are made and signed. Collaboration is one of the best tools to be used by small to medium-sized business owners to grow their businesses together. Collaboration is especially an effective tool for small business growth. Collaboration brings new inspirations for entrepreneurs. Sharing experiences and knowledge among firms who have built the alliance paves the way to a successful business. Small business growth essentially requires collaboration, as small businesses do not have a huge capital to manage all expenses through internal means and hire a huge staff. The collaboration brings knowledge, experience, learning, and motivation for all the business dealers. And, it can be made possible when all of the participants in a collaboration are equally interested in positive outcomes for their businesses.